Hi friends! It's been way tooooo looooong. First of all, Happy Mother's Day! I've been working on this post for 3 days now (crazy!) so I'm finally hitting publish today, Mother's Day. Hope you receive lots of love from your little monkeys today. I thought I'd play a little catch up here sharing some of my favorite pictures from this past week. We've been busy around here! Wow. First up, I'm preparing for my studio's spring dance recital which is next Saturday already. It just came so suddenly, I'm still trying to catch my breath on this one! This week was one of our dress rehearsals and I took the girls outside to take photos of them. They looked so beautiful and ethereal flitting about in those bright green fields. I tried to capture them playing out there, twirling and talking and laughing, just as a fresh change to some of our really pose-y dance pics. I'll share more of these pictures soon, but in the meantime, here are some phone pics that we snapped. Last weekend was wonderfully relaxing. I've been trying to take advantaging of the chill time while I still have it, as these next few weekends are really busy for me. So here's what most of it looked like … warm cinnamon rolls for breakfast, visits to the grandparents and the park, happy heart eyes for all the spring blooms, long naps, walks on the beach (just kidding). On Tuesday I celebrated my birthday and what they generally means for us is lots and lots of eating out. We started at The Creamery for brunch and I had a crazy good Bloody Mary and one of their specials which was some sort of Eggs Benedict with avocado, bacon and plantains. Really good stuff. As you can see, we ended up matching very nicely for Cinco De Mayo, always a good plan when you're, ahem …. 35 or older. Oh yes, and I cut my bangs! Couldn't resist a few photos of the pretty stuff which are on constant rotation in my Insta feed. This Asos dress (too big - super sad face), those Swedish Hasbeens (thanks Johanna! ), and mama and mini swimsuits which are being put to actual use every Wednesday morning for a mom and babe swim class. She's attending with her cousin Jude and they smile through the whole class like it's the best thing ever. Here are a few pictures of all the party shopping I've been doing. There's the recital decor, which is going to be so amazing (think clouds, stars, moon, candles) and then there's Scarlet's party and the flower workshop (giant confetti balloon and fresh flowers), and the dinner party which I grabbed these amber glasses and milk glass candle sticks for, care of St Vinnys. 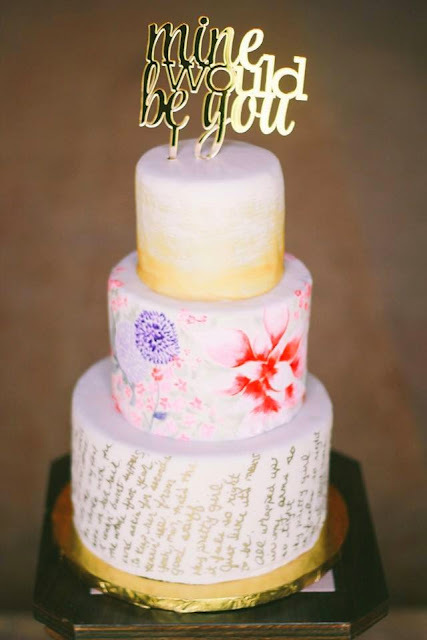 Heather created this masterpiece for our darling friend Nichole, who gave us her vision - gold, painted flowers and the lyrics to some of her and her husband's favorite songs. Photo by Kendra Bilotto. So you're all caught up! Let's hope that I get some outfit photos today and soon a mama and mini style post. It's the plan anyway. Lovely day everyone!